Burberry Brit for Men Summer 2012 is a fresh fragrance, oriental summer for men. Burberry Brit for Men Summer 2012 100ml. Eau De Toilette is a fresh fragrance, oriental summer for men, inspired by English summer. It is designed for men confident, but also humble, aware of their uniqueness. Essence refreshing summer casual and inviting you and gives you a feeling of rejuvenation. Burberry perfumes are appreciated worldwide, enjoying great popularity due to its classic essence, but also unique, created in the elegant and perfect style. 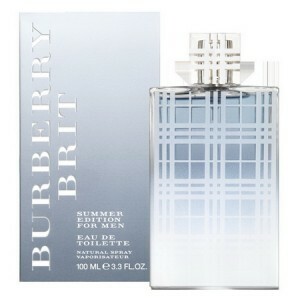 Burberry Brit Summer is lighter version of the original Brit perfume that gives a delightful freshness. Its flavor is mild and the sea breeze, bringing a wave of joy thrust. Design perfume is created in the traditional spirit of the brand Burberry, including even the typical plaid. Its open and warm colors, refer to the nature and summer. Perfume, and blue sky of summer blue sky and evoke contrasts delicate white squares. The fragrance was launched in 2012, in two versions, for women and for men. The fragrance opens with refreshing tones, juicy mandarin, cardamom and ginger spicy. Central notes of patchouli delightful hidden agreements and cedar combined with seductive rose. Base notes are composed of a combination of musk, vetiver and tonka bean. bright summer fragrance from the legendary British fashion house, based on the classic fragrance Burberry Brit. Inspired by the British summer, fragrance builds its wood-spicy composition of a special blend of seasonal ingredients that make up his notes. His deep sound like a thick dark green shade of lush trees, but with a pleasant, warm shades of spices. Spoil yourself with the essence of refined and unique summer fragrance Burberry Brit Summer!